A huge thanks to Birch Lane for sponsoring this post. My favorable opinion of gorgeous decor items is 100% my own. 🙂 For more information, see my disclosures here. 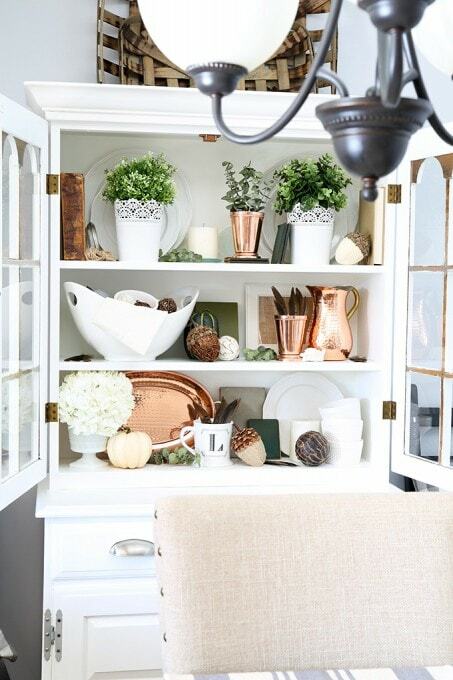 One of my most favorite things to decorate lately is my dining room hutch. I recently gave it a little paint job, and I have been rearranging its decor and trying out new and different items ever since! 🙂 With Thanksgiving just around the corner, of course I needed to dress it up for the occasion once again, and I thought I’d share my latest arrangement with you! Having a theme or color scheme helps create a unified space and helps everything flow more smoothly. 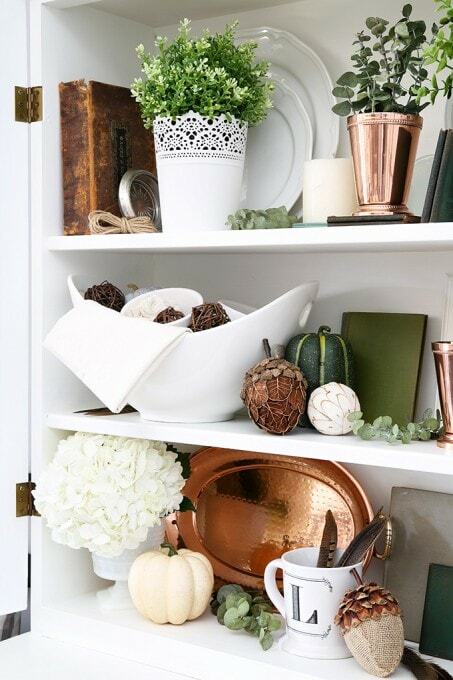 For me, a theme is also helpful because it narrows down my options from “you can literally put anything in the whole world in this space” to “keep your eye out for items that look this one certain way.” The copper tray, pitcher, and cups from Birch Lane were my starting point for my Thanksgiving hutch, and I decided to pair them with white dining pieces I already had as well as some natural elements to complete the color scheme. 2. Fill the back row. 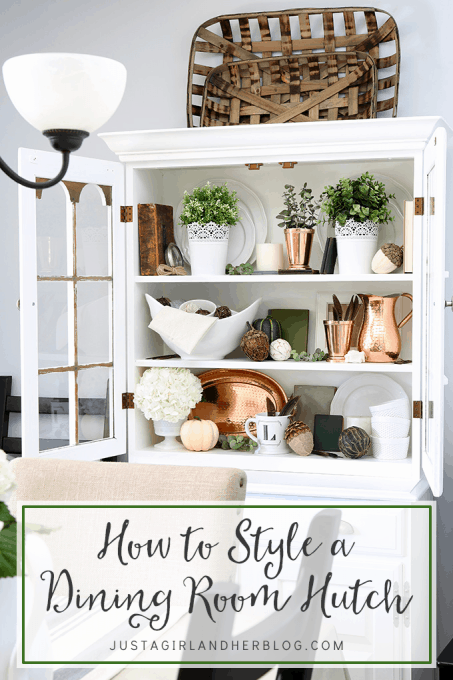 Layering is the name of the game when it comes to styling a hutch, so after I decide on my color scheme, I begin filling in the back row with items that are usually tall and lean-able. 🙂 Once I have these larger items in place to “ground” the whole arrangement, then I can start putting smaller pieces in front of them at different depths to add more layers. In my Thanksgiving hutch, I used different sizes of plates, a frame, some books, and the hammered copper tray in the back row, and everything else played nicely off of those pieces. 3. Add items of varied height. Just like having several layers of items from back to front helps to round out the hutch decor, having items of varying heights also helps to add interest. Sometimes this means using books or coasters to boost a piece. Other times stacking items (like I did with the ramekins) helps to vary the heights. And other times, just choosing pieces of different sizes does the trick. 4. Bring in plants and/or flowers. I think fresh (or sometimes even faux!) 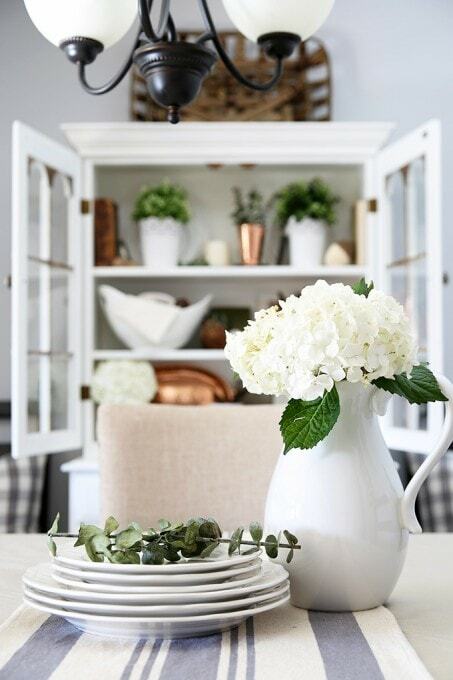 greenery and flowers can add so much to a vignette, so I almost always include some in my hutch decor. The fresh eucalyptus branches and hydrangea were my living element in this display, and the faux plants on the top shelf (Shhhhh… don’t tell!) helped bring in a little more green too. 5. Finish it of with something shiny. And finally, every hutch display needs a little bit of sparkle! Metallic elements are perfect for completing a look because they add some texture and shine. 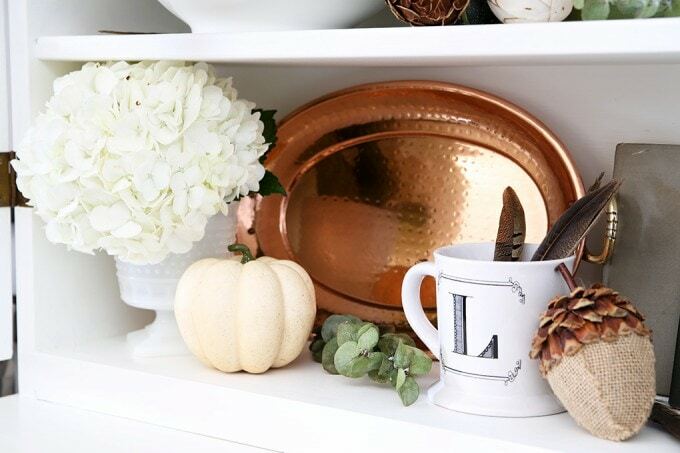 Of course the copper pieces fill my “shiny” requirement for my Thanksgiving hutch, and I may just even transition them over to Christmas because I love them so much!! 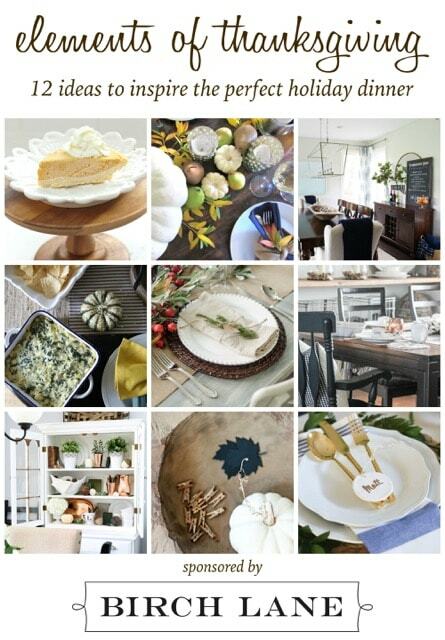 I am so delighted to be teaming up with Birch Lane and some of my bloggy besties today to bring you not only Thanksgiving hutch decor, but a full scope of Thanksgiving decor and treats to help you plan the perfect holiday gathering! Happy decorating, friends! Have a wonderful day! That is beautiful! Where do you get the acorns? Thank you so much, Janie! They are from Michael’s. 🙂 Have a wonderful day! Thank you so much, sweet friend! <3 Hope you are having a wonderful weekend! Super beautiful Abby! I absolutely LOVE all the copper!! Thank you so much, Krista! You are the sweetest! Hope you’re having a wonderful weekend! I’m with Krista and LOOOVE all the copper!!!! Thank you, sweet friend! The copper was love at first sight! 🙂 Hope you’re having a wonderful weekend! It looks absolutely beautiful, Abby! 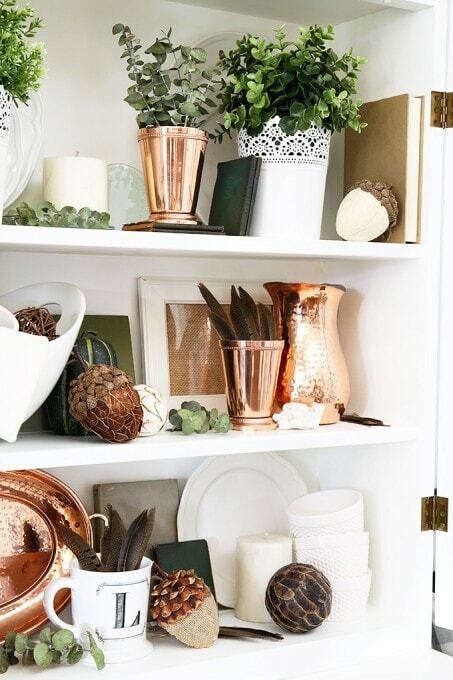 Love all of the texture from the greenery- and yes, the copper! Thank you so much, Nina! And thank you for organizing this hop– so much fun! Hope you have a wonderful weekend! Ahh.. you have me copper crushing over here! Lol! Thank you, Carrie! I have been seriously copper crushing this fall! Hope you have a wonderful weekend! 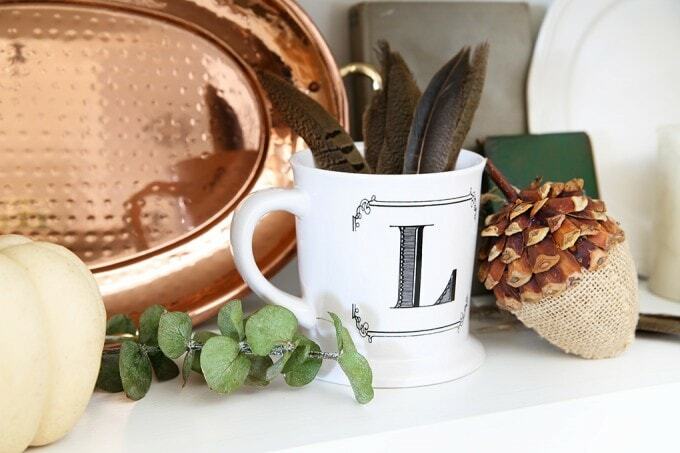 I LOVE the copper accents! I would never have thought to decorate with it but it looks fabulous! Abby, this is gorgeous! I learned quickly this isn’t as easy as it looks and I’m still working at it. I vp an totally appreciate the time and effort it takes to get just the look you want. 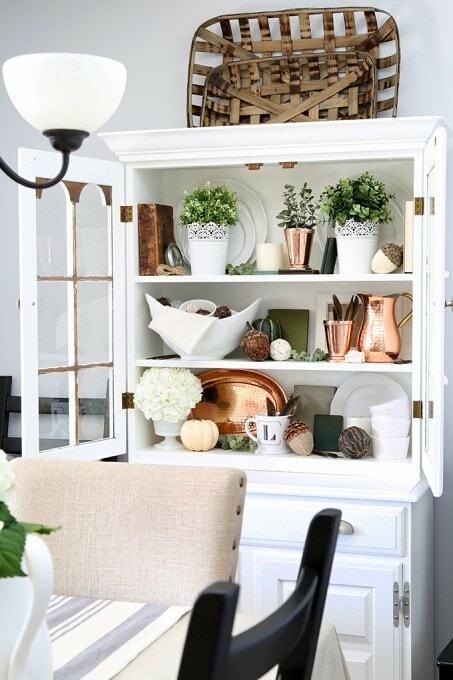 You incorporated two if my favorites in here; bright greenery accents and copper! Seriously, so pretty 🙂 thanks for sharing! These I great tips! I must confess I visit your blog mainly for the blogging tips, but I also love to check out your decor tips.